Americans and Canadians will likely face silver shortages in the future as investment demand continues to surge higher. Americans and Canadians will likely face silver shortages in the future as investment demand continues to surge higher. This will come at time as the silver price skyrockets, thus making it even harder for investors to acquire physical metal. This chart was first published in my THE SILVER CHART REPORT. It was one of 48 charts in the report on five sections of the Global Silver Market & Industry. As the price of silver skyrockets during the next global financial collapse, the Silver Market will become one of the world’s most explosive markets in the future. 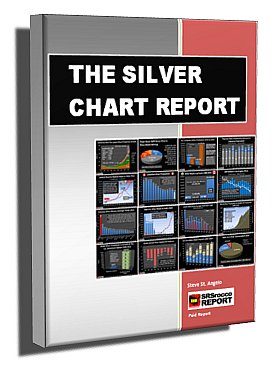 The Silver Chart Report is a must-read for the new and experienced precious metals investor. Most analysts focus on a certain area or sector of the silver market. However, the information in this report illuminates a holistic view of many sectors of the silver industry, capturing the relationships that connect many parts of the market. CLICK HERE to lean more about THE SILVER CHART REPORT. As the chart above shows, U.S. and Canada had to import nearly 34 Moz of silver in 2015 just to supply the surging Silver Eagle & Maple demand of 81.3 Moz, as their combined silver production of 47.6 Moz fell significantly short. 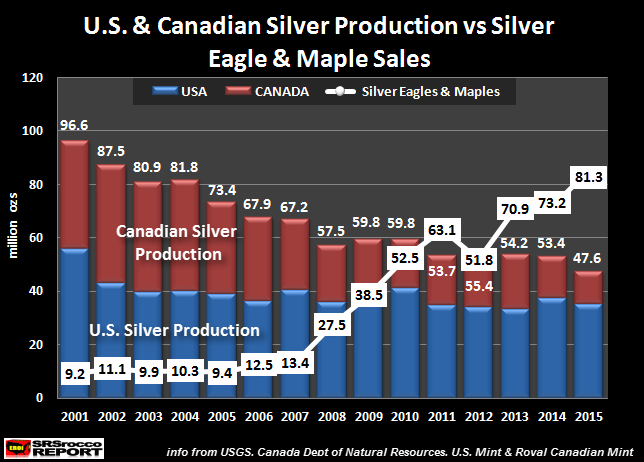 This was a huge change since 2001, as the U.S. and Canada had 87.4 Moz of their domestic silver mine supply remaining after 9.2 Moz went to their U.S. Eagle and Maple sales. Even though the U.S. and Canada had to import 34 Moz in 2015 just to supply their Official Silver coin program, this is only part of the total net physical silver investment deficit. If we include total U.S. and Canadian Silver Bar & Coin demand, the silver investment deficit is much larger. In 2001, the U.S. and Canada enjoyed a 86.1 Moz domestic silver mine supply surplus when total Silver Bar & Coin demand was deducted (Silver Eagle & Maple sales were 9.2 Moz and I estimated Silver Bar was 1.3 Moz for a total of 10.5 Moz). However, the situation has totally reversed as U.S. and Canadian Silver Bar & Coin demand hit a record 133.1 Moz in 2015. NOTE: The World Silver Surveys do not provide actual Official Silver coin demand figures for the U.S. or Canada (or for any other country). What they publish are total sales of each country’s Official Silver coin sales. Many Silver Eagles & Maples are purchased by foreigners. 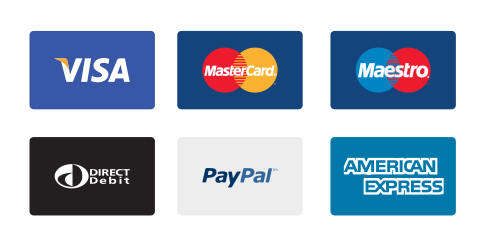 However, I believe Americans and Canadians purchase higher quantities of foreign Official Silver coins (Australian Kangaroos and Austrian Philharmonics) to offset Silver Eagles and Maples shipped abroad. 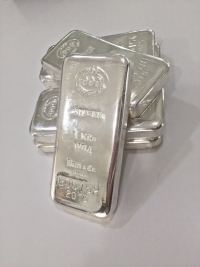 That 133.1 Moz Silver Bar & Coin demand figure for the U.S. and Canada includes 81.3 Moz of Silver Eagles and Maples as well as 51.8 Moz of reported U.S. Silver Bar demand (which now includes private bars and rounds). 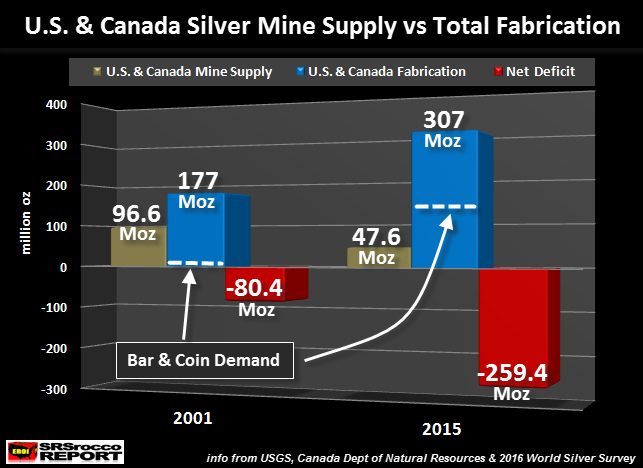 GFMS did not include any data for Canadian Silver Bar demand. Which means, the 133.1 Moz figure for the U.S. and Canada may be conservative. That being said, the U.S. and Canada suffered a 85.5 Moz net physical silver investment deficit. Which means, these two countries had to import 85.5 Moz of silver just to supply Silver Bar & Coin demand. This is a big deal if we compare the change since 2001. According to the data from the 2010 World Silver Survey, total U.S. and Canadian silver fabrication demand in 2001 was 177 Moz. Total silver fabrication demand includes industrial, jewelry, silverware and silver bar & coin. Thus, the U.S. and Canada only had to import 80 Moz of silver to supply all their silver needs in 2001. However, in 2015…. the situation changed drastically. The 2016 World Silver Survey reports that total silver fabrication demand for these two countries was a staggering 307 Moz–Silver Bar & Coin demand accounted for 133 Moz (43% of the total). 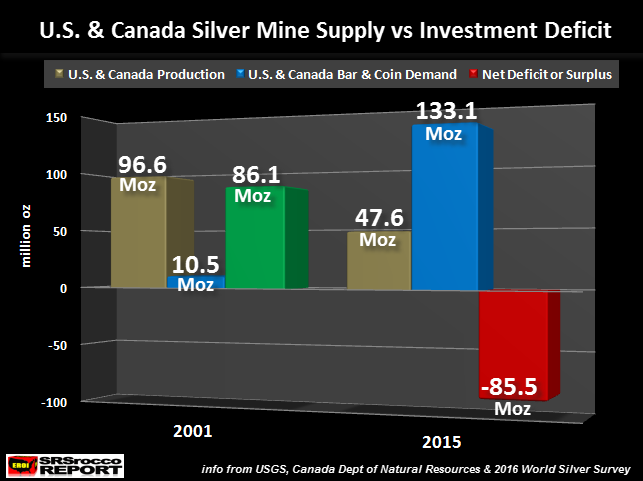 Now that U.S. and Canadian domestic silver mine supply has fallen to only 47.6 Moz (in 2015), these two countries had to import nearly 260 Moz to supply all their silver needs. This is more than three times what they had to import in 2001. The white dotted lines in the total fabrication blue bars in the chart represent Silver Bar & Coin Demand. In 2001, total Silver Bar & Coin demand was estimated to be 10.5 Moz, accounting for only 6% of total silver fabrication demand. However, total Silver Bar & Coin demand in 2015 shot up to 133 Moz, which represents 43% of the total 307 Moz in total fabrication demand of these two countries. Here is the CLINCHER. Total U.S. and Canadian silver industrial, jewelry and silverware demand (minus Silver Bar & Coin), only increased from 166.5 Moz in 2001 to 174 Moz in 2015. The big increase came from Silver Bar & Coin demand that jumped from 10.5 Moz in 2001 to 133 Moz in 2015. 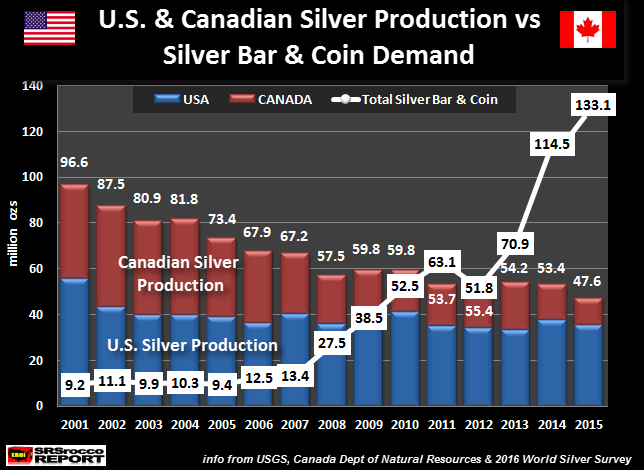 The United States and Canada will be in serious trouble when the world wakes up to the “SILVER STORY.” When institutions and hedge funds start to move into silver in a big way, there just won’t be enough silver to go around. The biggest squeeze will occur in the U.S. and Canadian market, where silver investment demand is now the highest in the world. Unfortunately, the U.S. and Canada will not be able to import enough silver to supply all of its silver needs…. only at much higher prices. Even then, I believe we are going to experience severe silver shortages. Some analysts say there is no such thing as a shortage. They claim that a higher price will satisfy any shortages. While that makes sense in FINANCE 101, it won’t work in the real market as investment demand skyrockets.